Once you’ve used the best in shared web hosting, you may find that your website’s traffic and resource demand exceed the limitations, often times, with your web host requesting that you upgrade to a Virtual Private Server (VPS) or upgrade to a full dedicated server. We’ve used several VPS hosting companies over the last 7 years. The short list we show below is based on VPS companies we currently use internally. In fact, there is not a VPS company missing from this list that we current use. We’ve Done the Pricing Math For You – Each VPS hosting service prices differently. Some offer monthly plans and some require prepayment (up to several years). In our recommendations, we mention the best value and the total cost that you will pay without unnecessary upgrades. Some things to watch for when ordering. Some VPS hosts offer “unsupported” plans that are missing a control panel. Unless your a Linux guru and know your way around the shell, you will always want to select a control panel. If you have shared hosting, it is very likely that you are using a themed cPanel, the most popular control panel in the hosting space. We strongly recommend sticking with cPanel when switching to a VPS because moving your sites will be a much simpler process. RAM is very important, just like it is on your personal computer. The bare minimum is 512MB RAM which will allow your cPanel to function, but will feel sluggish on certain administrative tasks. We recommend choosing a VPS plan with a minimum of 1GB RAM, especially if you have sites that use databases, like WordPress. These are the best VPS hosting services in our opinion. Look for an FAQ at the bottom of this page. If you have any questions we haven’t answered, find us on live chat or us the contact link at the bottom left. cPanel / SSD Are Standard with InMotion VPS! ​Plan priced on left includes whopping 4GB RAM, 60GB disk space, and 2TB Bandwidth. Also includes cPanel, 2 IPs and fast SSD data storage. Pricing is only available through T5A's red button below which activates an exclusive discount made available only to T5A visitors. A monthly plan is available but it renews at a pricey $54.99 for the smallest plan. 90-day full money back guarantee on prepaid plans. We chose InMotion Hosting as the best VPS plan because they set the standard on generous server resources. Their smallest plan comes with a massive 4GB RAM, 60GB of SSD storage space, 2TB transfer and they come feature packed with cPanel included! Unlike other VPS hosting services that offer barebones basic plans to attract people to their pricing, InMotion Hosting went the other way and focus on attracting customers that want reliable service. InMotion Hosting VPS plans also come with a 90-day money back guarantee when a prepayment is made. If you choose to go monthly (which we don’t recommend), you’ll get a 30-day money back guarantee. We love that, there’s no risk here, they know you’ll love their VPS service so much that they give you 3 months to make sure it is a perfect fit. InMotion Hosting has offered you, the visitor of T5A, an exclusive discount that will drastically reduce your 1st month of VPS hosting service. These prices are the cheapest you will find for InMotion Hosting top of the line VPS hosting service. 1 Month: $39.99 for the first month then $54.99 after that. 6 Months: $17.49 1st month. Total cost is $192.44 which breaks down to $32.07 per month. 12 Months: $14.99 1st month. Total cost is $344.88 which breaks down to $28.74 per month. If you can afford it, we recommend the 12 month prepay because you’ll save the most money over the length of your plan. Paying just $28.74 per month for a plan that offers such generous resources is unheard of. You’ll pay between $50-$150 per month elsewhere. Your InMotion Hosting VPS plan will also come with automated 24-36 hour backups and you can take advantage of their Max Speed Zone, which allows selection between two datacenters on the West or East side of United States (choose the one closest to you and, if you have local business sites, closest to your visitors). Would you like an ordering process walk-through? Click this InMotion Hosting VPS discount link. That page will walk you through every page of the ordering process where you’ll get our suggestions on all choices and upsells offered. MyHosting allows full customization of your VPS plan! MyHosting has offered all T5A visitors a 3 months free discount on the 1 year plan. Promo code: T5VPS which is auto-entered upon clicking our link to order. Build your VPS with cPanel, Plesk or no control panel at all. Customize disk space, RAM, IP addresses and bandwidth. Monthly, 3Mo, 6Mo, 1yr, 2yr, and 3 yr plans are available. Powerfull Dell PowerEdge servers. Available in Linux or Windows OS. MyHosting ranks high on our best VPS hosting list because of their custom VPS builder. We have yet to see another VPS host offer anything even close to this level of customizability. Whether you are looking for a high-resources VPS or something slimmed down to the basics, they have you covered. 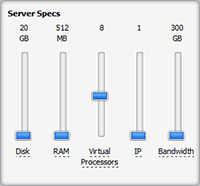 Simply adjust the slider to add space, RAM, processors, IPs and bandwidth. The price will adjust as you make your adjustments to help you find the exact VPS configuration you want that meets a price you want to pay. We love MyHosting because you can fully customize your VPS plan to include the exact features you are looking for. This is like building a custom dedicated server solution without the massive cost. We want to be fully transparent with you so we came up with some pricing packages with the T5VPS promo (requires 1 year prepay). cPanel, 20GB space, 512MB RAM, 300GB B/W. $19.32/mo. $231.84/yr paid on checkout. cPanel, 60GB space, 2GB RAM, 600GB B/W. $27.69/mo. $332.28/yr paid on checkout. “For Businesses” package, Plesk 10 domains, 40GB space, 1GB RAM, 600GB B/W. $14.21/mo. $170.55/yr paid on checkout. Of course, if you want the first plan above on a monthly payment plan, you can, only $27.70 per month with no setup fee. The 2nd 60GB plan would be $36.70 paid monthly. The 3rd “For Businesses” plan is $20.38 paid monthly. Great pricing with excellent server specs. MyHosting also offers pre-built VPS plans that you could choose from as well. Whether you are a developer or someone that wants to resell web hosting space, they have you covered. One nice thing about MyHosting is they don’t force a specific control panel or operating system. If you want Plesk, cPanel or no control panel, you can. If you want a Windows 2008 or Windows 2012 VPS or Linux CentOS or Ubuntu VPS, you can. Whatever MyHosting VPS plan you choose, you’ll have a 30-day money back guarantee period where you can test your VPS and make sure it is the right fit for you and your website(s). Remember, MyHosting is offering all readers of this page a 3 month free discount on 12 month prepaid VPS plans. Use coupon T5VPS during checkout. Click the red button below and your MyHosting VPS coupon will automatically activate. We've used KnownHost since November, 2010! Has VPS plans from 25GB space - 175GB space. From 768MB RAM - 7.5GB RAM. From 3TB Transfer - 16TB Transfer. SSD VPS plans start at $35 monthly with 20GB space. 1.25GB RAM and 3TB B/W. Use coupon KH15LIFE for a 15% off lifetime discount on VPS-2 or higher VPS plans. Use KNOWNSSD10 for a 10% off lifetime discount on any SSD VPS plans. KnownHost specializes in VPS hosting. They do not offer shared hosting. Feedback from popular web hosting forums and our experience reflect the highest satisfaction by their customers. Excellent support and reliability. There have been two times in the past 5 years where we’ve cancelled one of our VPS plans hosted on KnownHost and moved them elsewhere only to discover various reliability or customer support issues and moved back! If we were asked which hosting service has proven the test of time, these guys would get the nod, every single time. We’ve asked for SLA refunds twice over this period for various hardware-related outages, but even those were brief and their support gave us a bigger refund than anticipated, just to keep us happy. Whether you read forums or various social media platforms, you’ll be hard-pressed to find many negative experiences with KnownHost. That’s incredible considering how much traffic their site gets (21K Alexa ranking at the time of this writeup) and how popular they are. KnownHost does not offer shared hosting. These guys got their start with VPS plans and have only since expanded to SSD VPS and Managed Dedicated Servers for those who outgrow their highest VPS plan. Currently, KnownHost offers 7 standard VPS plans and 5 SSD VPS plans to choose from. If you are new to a VPS, start with a smaller plan and grow your way up to the higher plans (as we have) so that you only pay for space and resources that you use. If your site starts feeling sluggish under heavier and heavier load from traffic, place a support ticket, they will look over your VPS, make sure all is fine and then make recommendations based on their findings. Tapping out your RAM? They will recommend a pricing tier that will give you what’s needed. cPanel/WHM: $5/mo | DirectAdmin: $5/mo | Plesk: $5/mo | None: Free but unmanaged. Learn more about all of their features and options in our full KnownHost review linked below. Don’t forget your coupon code! If you are ordering VPS-2 or larger, Use KH15LIFE to get a lifetime 15% discount on their standard VPS plans or use KNOWNSSD10 for a lifetime 10% discount on any of their SSD plans. When price is not a factor, Liquid Web is the choice! Liquid Web has stood the test of time, founded 1997. $60/mo gets you 1GB RAM, 50GB space, 1CPU, cPanel and 5TB bandwidth. Features daily billing with easy upgrades and downgrades. RAID SSD VPS with free Firewall Protection. CentOS, Ubuntu, Debian and Fedora OS available. The next level is a 2GB RAM, 100GB Disk SSD VPS for $100 w/cPanel. Yes, the price you pay for Liquid Web is one of the highest you’ll see in the industry, however, for that price you will be getting one of the most reliable and trusted VPS services in the industry. Along with the service, they have their onsite, 24/7/365 Heroic Support® (registered trademark of Liquid Web) that has one of the most incredible service level agreements that you will see. They promise 24/7 US-based telephone & live chat that answers in less than 59 seconds, 30 minute resonses on helpdesk tickets, a 100% network and power uptime guarantee and a 30 minute hardware replacement guarantee. Once you have your account, you will also have access to instant provisioning which allows you to roll out new VPS plans that will be instantly available for use. If there ever comes a time when you need to setup a testing server, you can do it and pay for just the amount of time you need with their daily rate. Already have shared hosting or a VPS service that you are switching from? Liquid Web will help you with free site migrations. The three data centers that Liquid Web uses are wholly owned and operated. If you ever need to upgrade from this $60 plan, consider looking into their dedicated servers. At the time of this writing, we saw an AMD Phenom 2.8Ghz, 3.7GB RAM 47GB SSD hard drive for just $130/mo with cPanel. Pricing on the left based on their VPSClass plan which comes with cPanel and fully managed support. VPSClass plan includes 50GB space, unlimited transfer and 1.5GB RAM. Use coupon TFA10 during your plan selection and save 10% off any VPS. cPanel plans also include Softaculous to auto-install software like WordPress. Arvixe is now owned by Endurance Internal Group (EIG). On August, 2015 Arvixe slid down the list of recommended providers because of issues with reliability as reported to @TygrScott by their customers on Twitter. Arvixe was recently purchased by Endurance International Group and usually what happens is they move their clients from prior datacenters to their own which can cause serious problems. We were able to confirm server migrations were occurring this month on their forums. According to posts we’ve seen shared on popular web hosting discussion forums, there’s a few servers having issues after the migrations were completed. Although we find Arvixe VPS plan options to be limited, there may be a plan that is perfect for you, our reader. We’d only recommend the VPSClass or VPSClass Pro or the equivalent ASP plans because these VPS options include full support with cPanel. One thing that stands out to us is they include Softaculous which normally has a $5-10 fee from other hosts. This is a great option for those who plan to have clients hosted on their VPS who need access to an easy way to install WordPress and other popular open source platforms. Another interesting feature they include is access to Attracta SEO service which will provide you with tools that will assist with improving the chances at a higher ranking in popular search engines. Arvixe VPS also includes $100 in Google AdWords and $100 in Yahoo / Bing advertising credits. This is unusual for VPS plans, normally the vouchers are only made available to those on shared hosting plans. Remember, Arvixe is offering all readers of this page a 10% discount on any VPS plan. Use coupon TFA10 when selecting your plan and the discount will apply. Use the red button to automatically insert your coupon on the plan selection page. Since we've launched our live chat feature here and also happily respond to customer support requests in our contact form listed at the bottom footer, we've seen a common set of questions. Click the question to reveal our answers. How many sites can I host with a VPS? The best part of a VPS is it acts very much like a dedicated server. You are going to get access to cPanel's WHM administrative access area that will allow you to create as many cPanel accounts as you want. Your only limit is the space, bandwidth and RAM usage. cPanel's WHM stands for Web Host Manager. This allows you to manage all of the settings on your VPS plan when you can add cPanel packages, create system backups, tweak system settings and so much more. Don't worry, if you choose one of the best VPS hosts listed above, you'll have excellent customer support to assist you if needed. When you are on a shared hosting service, you are sharing the available resources on a server with every account on that server. If you pick a bad host, they may cram too many on a shared server which can cause serious performance problems on your website. I'm starting my first website. Do you recommend a VPS? No. If you are starting your first website(s), your site will not need dedicated resources early on. As your site gets established and grows, there will come a point in time when you want your site to load as fast as possible or you might see a message from your host's support saying that your site is using too much resources. In either case, your site should be earning money and can afford the upgrade to a VPS. Until that point, go with one of our recommended shared hosting providers. I'm running 6 sites on another host and want a VPS, how hard is it to switch? If you are currently using a web host that uses cPanel, it is fairly easy to switch. Even if your current host prevents your chosen VPS company from accessing the server, you'll still be able to download full backups of your website, upload them to your VPS and then use cPanel's WHM to setup the accounts. Ask your new VPS provider if they will help you with the migration, most of the time they will gladly help you, within reason. MediaTemple VPS Review – This company was acquired by GoDaddy. You’ll get a 99.999% uptime guarantee and SSD storage. For managed VPS service (with cPanel, the cheapest plan is $55/mo which includes 2GB RAM, 30GB storage and 2TB bandwidth. From there, you’ll pay $100+ per month if you need an upgrade to your storage or RAM requirements. Codero Cloud Hosting Review – Their model can be confusing because there is no up-front pricing until you create an account and build the cloud service that fits your needs. Consider the Codero MicroCloud for a true PRIVATE service but that’ll cost you $288/mo+. HostGator VPS Review – HostGator was acquired by Endurance International Group. We’d recommend the “Snappy 1000” plan that offers 1GB RAM, 60GB space, 1TB bandwidth for $49.95/mo. They offer discounts on their site on your signup that allows prepayment to save. For instance, the Snappy 1000 allows prepayment at $33.97 for up to a year before switching to the $49.95 rate. All pricing includes full management with cPanel. GreenGeeks VPS Review – Their base plan has 1GB RAM, 25GB SSD RAID-10 storage and 1TB bandwidth for $39.95. Their price includes cPanel/WHM and a promise that your VPS will be ready within 60 seconds of account verification. They will migrate your site from another host for free, backup your data nightly and is powered by 300% renewable energy (there’s even a green hosting badge you can use on your site).